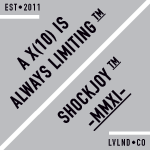 A commemorative sticker was created to celebrate the launch of the AXIAL™ brand tee shirt clothing line. These durable white vinyl rectangular stickers with lamination and printed in PMS Black ink are great for indoor and outdoor use. Spread the word!